Early 20th century archaeologists used to think that Mesolithic people lived in small, mobile bands that moved about an open landscape. In the 1960s finds at the site of Padina in the Iron Gates region now in present-day Serbia upended these prior notions when archaeologists found ancient buildings and evidence of complex architecture and carved stone monuments . Evidence is growing from across Europe that the Mesolithic was a time of increasing populations and a shift towards settled village life. In the Eastern Europe boreal forests Mesolithic peoples employed a diverse set of hunting and gathering strategies, including fishing and sealing, which was also common throughout the Baltic [11-12]. Finds of large burial sites have suggested these people lived in large communities . They made use of local forests to produce wooden structures and buildings. In Western Europe, the Azilian people of Northwest Spain began using more marine resources and diversified their hunting strategies . One of the hallmark tools found in the region is the Azilian harpoon, which has been found at multiple sites across the region . 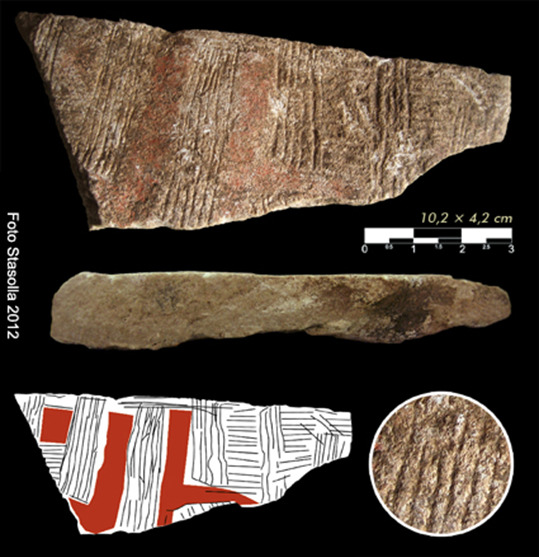 In the Ertebølle culture found in present-day Sweden, Mesolithic peoples began producing pottery, which was likely used to store foods and for cooking . Pottery was not only a major technical development, but also was a sign of the increasingly sedentary lifestyles of these people. Ceramics are heavy and had never appeared before when people needed to be highly mobile. The rock shelter called Riparo Villabruna where one of the two skeletons in this sample was found is located near the city of Bolzano in present-day Northern Italy. The site had a long history of habitation throughout the late Paleolithic. Many artifacts have been found at the site including stone knives, hammers, bone points, and red ochre, which was used for ritual purposes . The individual in this sample was a male around the age of 25. There is some evidence that there was an attempt to treat the cavities in his teeth, which is considered to be the first ever evidence of dentistry . This individual was carbon-dated by charcoal from surrounding layers to between 14,180 and 13,780 years old. The other individual was found at a cave site dating to the same period called Grotta Continenza. This site was occupied from the Paleolithic until the Bronze Age [16-17]. Grotta Continenza is located in the Abruzzo region of present-day Central Italy and was carbon dated to between 11,200 and 10,510 years old using charcoal in archaeological deposits . Genetic testing has found both of these individuals to be closely related to late Paleolithic samples taken from across Europe. These people were genetically distinct from agricultural peoples that moved into Europe from the Middle East around 9,000 years ago . There was a surprise results detected in the sample from Villabruna. This was male individual had a R1b Y chromosome haplogroup, which is common in Europe today due to migration of Steppe people during the Bronze age, but was not expected to be found in a Paleolithic hunter-gatherer. This suggested that there were contacts with people from the east towards the Caucuses earlier than previously though . Both of these individuals had mitochondrial U5 haplogroups, which was the most common haplogroup among European hunter-gatherers and still exists in Europe today although at lower frequencies .